Genome regulation encompasses all facets of gene expression, from the biochemical modifications of DNA, to the physical arrangement of chromosomes and the activity of the transcription machinery. The genome regulation programs that cells engage control which proteins are produced, and to what level. The programs are established during stem cell differentiation, and therefore dictate the specialized functions that the cell will carry out throughout its lifetime. Like all aspects of cellular life, the regulation of gene expression is itself tightly regulated. Although there are regulatory mechanisms encoded into the genome itself, extracellular cues in the form of mechanical stimuli, as well as biochemical cues, also play critical roles. Signal relay systems that sense physicochemical signals at the plasma membrane can rapidly transduce a signal to the nucleus, where it will, influence chromatin organization, the accessibility of the genome to the transcription machinery. This in turn will impact gene expression and protein synthesis. It is therefore not surprising that a number of diseases, including cancers and cardiovascular diseases, are linked to deregulated gene expression arising from defective nuclear mechanosignaling . Cells are exposed to various forces from their microenvironment. These signals can be sensed through receptors and transduced to the nucleus through the actin cytoskeleton or microtubules as well as through regulatory molecules. These signals modulate the three-dimensional organisation of chromosomes in the nucleus to regulate gene expression programmes. 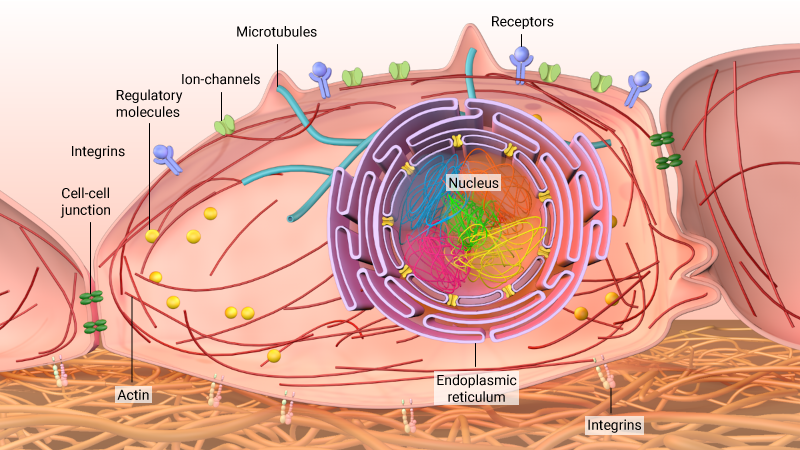 The translocation of transcription factors or repressors into the nucleus via nuclear pores is well known. However, a direct transmission of force signals between the cytoplasm and nucleus is also possible – despite the nuclear material being separated from the cytoplasm by the nuclear envelope. Such an alternative method of signaling is made possible by the presence of proteins located within the inner and outer nuclear membranes, which associate with each other to effectively bridge the perinuclear space. SUN1, for example, is located on the inner membrane, and members of the nesprin family are located in the outer nuclear membrane. SUN1 and the nesprins will not only associate with each other, but also with nuclear lamina proteins, and the cytoskeleton, respectively. These proteins, therefore, serve as conduits for the transduction of external forces into the nucleus . Cytoskeleton filaments are coupled with the nucleus via the linker of nucleoskeleton and cytoskeleton (LINC) complex. 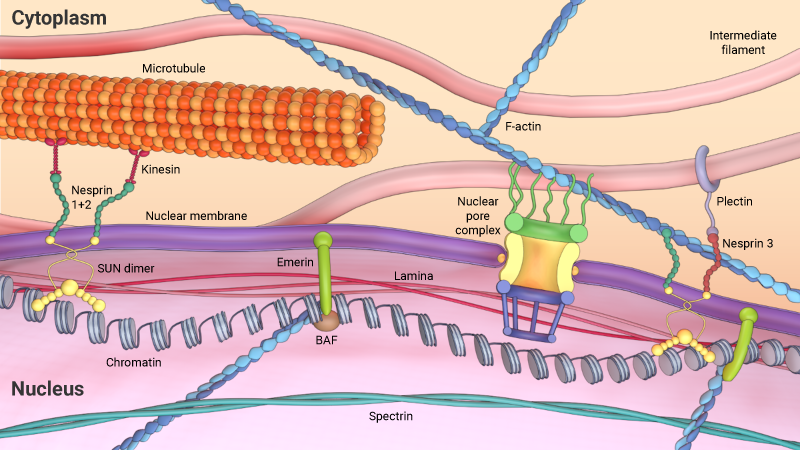 Nesprins, located on the outer nuclear membrane, physically links with the actin, microtubules, and intermediate filaments and are also connected to the inner nuclear membrane through dimers of SUN-domain proteins, which are linked to the nuclear lamina and chromatin. These links between the cytoskeleton and nucleus applies differential mechanical forces on the nucleus. 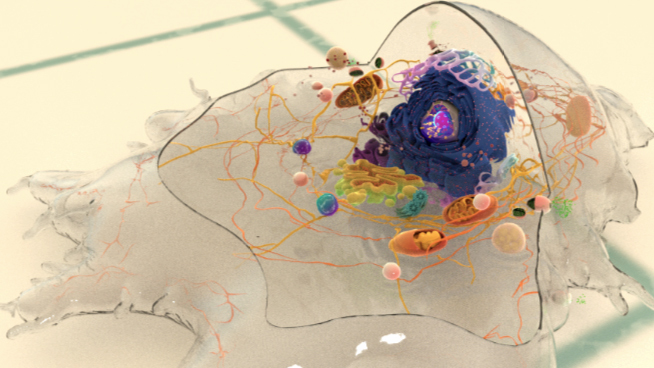 The consequence of these connections, is that physical changes in a cell’s environment not only induce cytoskeletal rearrangements within the cytoskeleton, but also remodel nuclear architecture and alter gene expression. A recent study has shown, for example, that nuclear morphology is directly related to the presence of well-established cytoskeletal structures. In this case, perturbations to actin filaments and microtubules were shown to influence nuclear volume and the degree of nuclear prestress . The integration of mechanical signals into the nucleus, and the subsequent effect on gene expression, is largely dependent on the organization of the genetic material inside the nucleus. DNA exists as condensed structures called chromatin or chromosomes. These are formed when the DNA strands wrap around histone, and non-histone proteins. 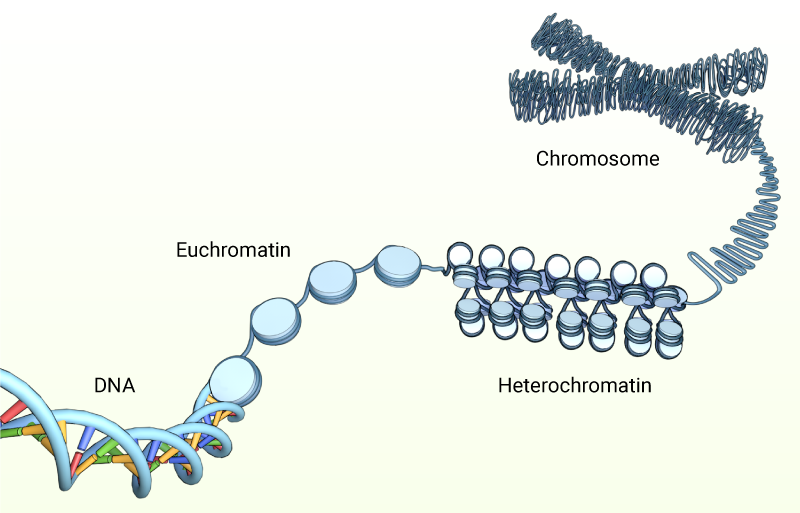 Varying degrees of condensation lead to both lightly-packed (euchromatin) and highly condensed (heterochromatin) regions. DNA wraps around histones and non-histone proteins, and condense into lightly-packed (euchromatin) and highly-packed (heterochromatin) regions during interphase of the cell cycle. From prophase through to telophase the chromatin is further packed into highly condensed chromosomes. These regions differ in the level to which they are transcribed, with the former containing the transcriptionally-active regions of DNA, and the latter being predominately inactive. In addition to DNA packaging, the nuclear architecture is further determined by a non-random, three-dimensional positioning of the chromosomes into distinct chromosomes territories . This spatial organization of chromatin contributes further to the regulation of gene expression. This has been shown in studies exploring the radial alignment of chromosomes, where gene-active chromosomes were shown to localize near the center of the nucleus and gene-inactive chromosomes at the nuclear periphery . 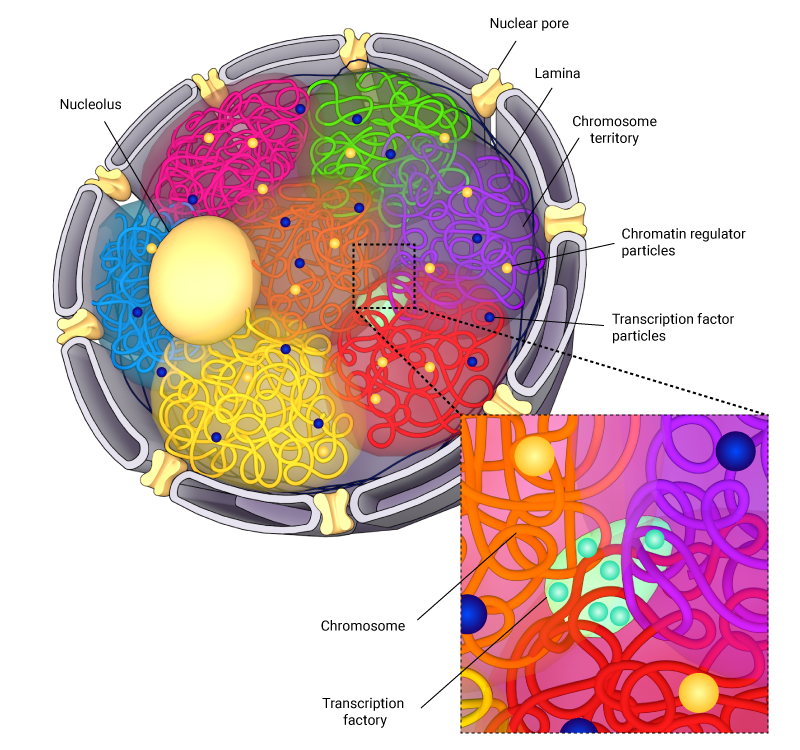 Schematic depicting the spatial arrangement of chromosomes in the nucleus. Here, chromosome are spatially arranged into compartments, with overlapping regions, which are termed interchromosomal compartments, being associated with increased levels of transcription machinery. Additionally, studies using chromosomal capture assays have demonstrated the presence of chromosome neighborhoods, such as interchromosomal compartments (ICs), which house the transcription machinery. These ICs function as regions for gene co-regulation, where gene-rich regions of neighboring chromosomes form loops that intermingle, thereby allowing transcriptional machinery to be shared by neighboring chromosomes . This chromosomal architecture, and in turn the overall nuclear stability, is maintained by a filamentous network of lamin proteins called the nuclear lamina, which not only scaffolds or positions the chromosomes, but also regulates gene transcription by directly or indirectly interacting with the chromatin . Lamina-mediated gene silencing has been linked to cellular differentiation mechanisms, whereby lineage-specific genes that require activation come away from the lamina and pluoripotency genes that needs to be silenced get tethered to the lamina . In such a mechanically-connected nuclear landscape, external forces or stresses transmitted via cytoskeletal-lamina linkages can directly influence steps in chromosomal reorganization, such as condensation, decondensation, looping, and accessibility of transcriptional machineries to promoter regions that would eventually regulate gene transcription and protein synthesis. The ability of cells to express a specific set of genes and synthesize proteins at predefined levels enables them to specialize in a particular role or function. This specialization is established as stem cells undergo a process known as differentiation. This crucial step in the development of every organism has recently been exploited in laboratories that aim to grow mammalian tissues or organs from stem cells. The nuclear dynamics of stem cells are distinct from those of differentiated cells, and this relates to the physical or mechanical properties of the cells. For example, stem cells have the capacity to replicate whilst maintaining their undifferentiated state but will express a wide range of genes at low levels. Stem cells also possess a less-developed cytoskeletal network, which will only exert low levels of tension on the nuclear membrane. This translates to a soft and mechanically pliable nucleus . Additionally, reduced Lamin A expression in the stem cell stage is associated with poorly-developed nuclear lamina and reduced nuclear stiffness . The plasticity of chromatin organization and nuclear architecture in stem cells increases the dynamic interactions between chromosome loci for transcriptional coregulation. However, various stimuli during cellular differentiation programs induce large-scale reorganization of the cytoskeleton and the lamina. This leads to nuclear stiffening and alters the condensation of chromosomes to induce altered gene expression, protein synthesis and lineage commitment. Once differentiated, a cell will maintain its gene expression profile to ensure it meets the functional requirements of the differentiated population. This will ultimately give rise to tissues such as epithelial tissue, muscle tissue or nervous tissue. The integration of mechanical signals into nuclear function is highly regulated. When this regulation fails, disease states may arise. In most cases, however, it is difficult to determine whether a change in the genetic profile of a cell is the cause, or the effect, of a given disease. Even with proofreading capabilities and numerous regulatory mechanisms in place, errors can still be introduced into the DNA code. Known collectively as mutations, these alterations in the genome, may be introduced when the machinery that synthesizes DNA, RNA or proteins is defective, or expressed at an altered level. Mutations in transcription factors, elongation factors, and in the regulatory sequences of genes are often responsible for perturbations in RNA synthesis. Likewise, mutations in ribosomal proteins and translational elongation factors such as tRNA, are often responsible for perturbations in protein synthesis. When transcribed or translated, mutations can lead to proteins having reduced function, or not functioning at all. More commonly however, it can lead to proteins being over- or under-expressed to a level that is detrimental to the cell. Cancer is one of the most common diseases to be associated with DNA mutations, or dysfunctional regulation of gene or protein expression. Amongst the most notable mutations contributing to cancer are those that occur in the BRCA1 and BRCA2 genes. Although present in a small percentage of the population, mutations in these genes are associated with a poor prognosis in breast cancer patients. The product of these genes, known as ‘breast cancer type susceptibility protein’, normally function in the repair of double-stranded DNA breaks, and in mismatch repair. This means that they normally serve as tumor suppressors. However, when mutated, these proteins do not function correctly and therefore promote the incorporation of additional mutations. In recent years, significant work has focused on identifying a mechanical basis for the onset and development of cancer. To this end, the metastatic properties of cancer cells can be induced by, or exacerbated by, the mechanical properties the tissue microenvironment. For example, studies have shown a clear association between increased ECM stiffness in breast tissue, and the risk of breast cancer transformation or developing carcinomas . 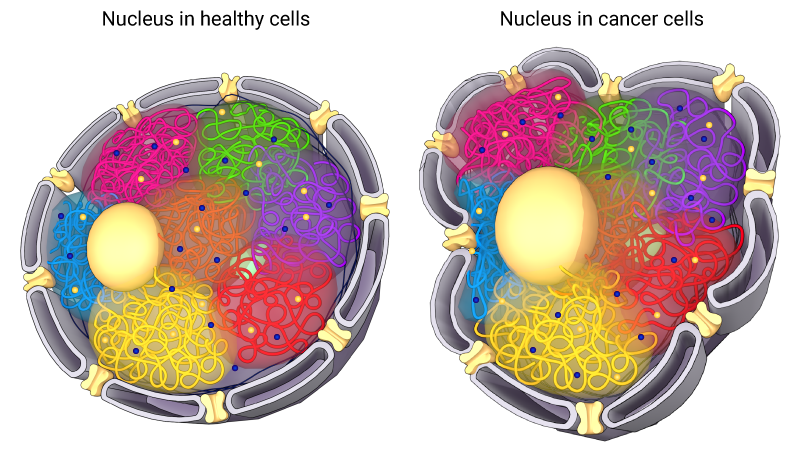 Proteins that maintain the correct nuclear dynamics and function may also be altered in cancer and other diseases. For example, a number of diseases caused by mutations in genes encoding the lamins have been identified. Generally referred to as laminopathies, this disease group includes over 25 distinct diseases or disorders. These include muscular dystrophies, cardiomyopathies and Hutchinson-Gliford progeria. To date these disease states have been mapped to over 250 mutations in LMNA gene . Schematic depicting changes in nuclear morphology that are caused by laminopathies. Importantly, an altered nuclear phenotype, as is observed when the LMNA gene is mutated, may also give contribute to the metastatic properties of cancer cells. Tissue invasion is an important aspect in a cell’s ability to metastasize. As cells pass through convoluted three-dimensional spaces they must be able to squeeze through narrow passages. Efficient migration through these spaces requires a deformable nucleus and the condensing of chromosomes. With a reduction in lamins, nuclei become deformable, allowing the cells to pass through narrow spaces in the extracellular matrix or between cells . This is an important property in the normal functioning of embryonic stem cells and human neutrophils. Given the key roles of the nuclear lamina in regulating genome organization and gene transcription, it is not surprising that a number of laminopathies have been partly attributed to impaired mechanosignaling in cells . For instance, Lamin A deficiency in muscular dystrophy is known to result in impaired mechanical integrity of the nucleus, enhancing their susceptibility to strain-induced apoptosis and necrosis .